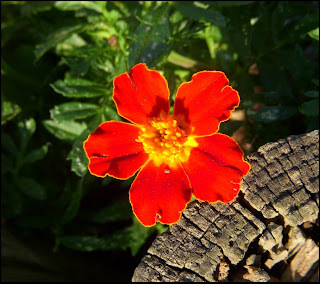 When I was very young, Mom always grew marigolds in a planter at the front of the house. I say "always," although I don't really know how many years she did it. I remember going out front with an envelope and watching as she collected marigold seeds. We put them in the envelope, and she said we would plant them the next year and grow more marigolds. I don't know if we did or not, but I remember collecting the seeds. Isn't it funny the things that stick in your mind? I probably wasn't any older than four years old at the time. Do you ever wonder what your children will remember when they grow older? What moments they will carry with them?